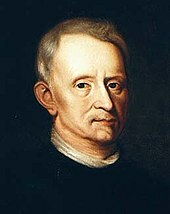 Robert Hooke FRS (/hʊk/; 28 July [O.S. 18 July] 1635 – 3 March 1703) was an English natural philosopher, architect and polymath. His adult life comprised three distinct periods: as a scientific inquirer lacking money; achieving great wealth and standing through his reputation for hard work and scrupulous honesty following the great fire of 1666, and eventually becoming ill and party to jealous intellectual disputes (the last may have contributed to his relative historical obscurity). At one time he was simultaneously the curator of experiments of the Royal Society, a member of its council, Gresham Professor of Geometry, and Surveyor to the City of London after the Great Fire of London (in which capacity he appears to have performed more than half of all the surveys after the fire). He was also an important architect of his time – though few of his buildings now survive and some of those are generally misattributed – and was instrumental in devising a set of planning controls for London whose influence remains today. Allan Chapman has characterised him as "England's Leonardo". Hooke studied at Wadham College, Oxford during the Protectorate where he became one of a tightly knit group of ardent Royalists led by John Wilkins. Here he was employed as an assistant to Thomas Willis and to Robert Boyle, for whom he built the vacuum pumps used in Boyle's gas law experiments, and conducted the experiments themselves. He built some of the earliest Gregorian telescopes and observed the rotations of Mars and Jupiter. In 1665 he inspired the use of microscopes for scientific exploration with his book, Micrographia. Based on his microscopic observations of fossils, Hooke was an early proponent of biological evolution. He investigated the phenomenon of refraction, deducing the wave theory of light, and was the first to suggest that matter expands when heated and that air is made of small particles separated by relatively large distances. He proposed that heat was the manifestation of faster movement of the particles of matter. He performed pioneering work in the field of surveying and map-making and was involved in the work that led to the first modern plan-form map, though his plan for London on a grid system was rejected in favour of rebuilding along the existing routes. He also came near to an experimental proof that gravity follows an inverse square law, and first hypothesised that such a relation governs the motions of the planets, an idea which was developed by Isaac Newton, and formed part of a dispute between the two which caused Newton to try to erase Hooke's legacy. He originated the terraqueous globe theory of geology, disputed the literal Biblical account of the age of the earth, hypothesised the idea of extinction, and wrote numerous times of the likelihood that fossils on hill and mountain tops had been raised there by "earthquakes", a general term of the time for geological processes. Much of Hooke's scientific work was conducted in his capacity as curator of experiments of the Royal Society, a post he held from 1662, or as part of the household of Robert Boyle. Much of what is known of Hooke's early life comes from an autobiography that he commenced in 1696 but never completed. Richard Waller mentions it in his introduction to The Posthumous Works of Robert Hooke, M.D. S.R.S., printed in 1705. In the chapter Of Dr. Dee's Book of Spirits, Hooke argues that John Dee made use of Trithemian steganography, to conceal his communication with Queen Elizabeth I. The work of Waller, along with John Ward's Lives of the Gresham Professors (with a list of his major works) and John Aubrey's Brief Lives, form the major near-contemporaneous biographical accounts of Hooke. It appears that Hooke was one of a group of students whom Busby educated in parallel to the main work of the school. Contemporary accounts say he was "not much seen" in the school, and this appears to be true of others in a similar position. Busby, an ardent and outspoken Royalist (he had the school observe a fast-day on the anniversary of the King's beheading), was by all accounts trying to preserve the nascent spirit of scientific inquiry that had begun to flourish in Carolean England but which was at odds with the literal Biblical teachings of the Protectorate. To Busby and his select students the Anglican Church was a framework to support the spirit of inquiry into God's work, those who were able were destined by God to explore and study His creation, and the priesthood functioned as teachers to explain it to those who were less able. This was exemplified in the person of George Hooper, the Bishop of Bath and Wells, whom Busby described as "the best scholar, the finest gentleman and will make the completest bishop that ever was educated at Westminster School". 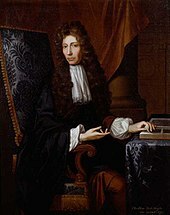 Robert Boyle by Johann Kerseboom, at Gawthorpe Hall, Lancashire. In 1653, Hooke (who had also undertaken a course of twenty lessons on the organ) secured a chorister's place at Christ Church, Oxford. He was employed as a "chemical assistant" to Dr Thomas Willis, for whom Hooke developed a great admiration. There he met the natural philosopher Robert Boyle, and gained employment as his assistant from about 1655 to 1662, constructing, operating, and demonstrating Boyle's "machina Boyleana" or air pump. It was not until 1662 or 1663 that was awarded a Master of Arts degree. In 1659 Hooke described some elements of a method of heavier-than-air flight to Wilkins, but concluded that human muscles were insufficient to the task. Hooke himself characterised his Oxford days as the foundation of his lifelong passion for science, and the friends he made there were of paramount importance to him throughout his career, particularly Christopher Wren. Wadham was then under the guidance of John Wilkins, who had a profound impact on Hooke and those around him. Wilkins was also a Royalist, and acutely conscious of the turmoil and uncertainty of the times. There was a sense of urgency in preserving the scientific work which they perceived as being threatened by the Protectorate. Wilkins' "philosophical meetings" in his study were clearly important, though few records survive except for the experiments Boyle conducted in 1658 and published in 1660. This group went on to form the nucleus of the Royal Society. Hooke developed an air pump for Boyle's experiments based on the pump of Ralph Greatorex, which was considered, in Hooke's words, "too gross to perform any great matter." It is known that Hooke had a particularly keen eye, and was an adept mathematician, neither of which applied to Boyle. It has been suggested that Hooke probably made the observations and may well have developed the mathematics of Boyle's law. Regardless, it is clear that Hooke was a valued assistant to Boyle and the two retained a mutual high regard. There is a widely reported but seemingly incorrect story that Dr Hooke corresponded with Thomas Newcomen in connection with Newcomen's invention of the steam engine. This story was discussed by Rhys Jenkins, a past President of the Newcomen Society, in 1936. Jenkins traced the origin of the story to an article "Steam Engines" by Dr. John Robison (1739–1805) in the third edition of the "Encyclopædia Britannica”, which says There are to be found among Hooke's papers, in the possession of the Royal Society, some notes of observations, for the use of Newcomen, his countryman, on Papin's boasted method of transmitting to a great distance the action of an mill by means of pipes, and that Hooke had dissuaded Newcomen from erecting a machine on this principle. Jenkins points out a number of errors in Robison's article, and questions whether the correspondent might in fact have been Newton, whom Hooke is known to have corresponded with, the name being misread as Newcomen. A search by Mr. H W Dickinson of Hooke's papers held by the Royal Society, which had been bound together in the middle of the 18th century, i.e. before Robison's time, and carefully preserved since, revealed no trace of any correspondence between Hooke and Newcomen. Jenkins concluded ... this story must be omitted from the history of the steam engine, at any rate until documentary evidence is forthcoming. Newton, as President of the Royal Society, did much to obscure Hooke, including, it is said, destroying (or failing to preserve) the only known portrait of the man. It did not help that the first biography of Wren, Parentalia, was written by Wren's son, and tended to exaggerate Wren's work over all others. 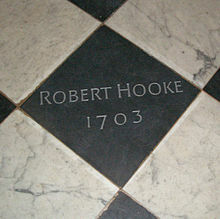 Hooke's reputation was revived during the twentieth century through studies by Robert Gunther and Margaret 'Espinasse. After a long period of relative obscurity he has now been recognised as one of the most important scientists of his age. Robert Hooke spent his life largely on the Isle of Wight, at Oxford, and in London. He never married, but his diary records that he had sexual relations with his niece, Grace, and several of his housekeepers. He at one point records that one of these housekeepers gave birth to a girl, but doesn't note the paternity of the child. On 3 March 1703, Hooke died in London, and a chest containing £8,000 in money and gold was found in his room at Gresham College. Although he had talked of leaving a generous bequest to the Royal Society which would have given his name to a library, laboratory and lectures, no will was found and the money passed to an illiterate cousin, Elizabeth Stephens. He was buried at St Helen's Bishopsgate, but the precise location of his grave is unknown. It is interesting[to whom?] from a twentieth-century vantage point that Hooke first announced his law of elasticity as an anagram. This was a method sometimes used by scientists, such as Hooke, Huygens, Galileo, and others, to establish priority for a discovery without revealing details. While many of his contemporaries believed in the aether as a medium for transmitting attraction or repulsion between separated celestial bodies, Hooke argued for an attracting principle of gravitation in Micrographia (1665). Hooke's 1666 Royal Society lecture on gravity added two further principles: that all bodies move in straight lines till deflected by some force and that the attractive force is stronger for closer bodies. Dugald Stewart quoted Hooke's own words on his system of the world. In 1686, when the first book of Newton's Principia was presented to the Royal Society, Hooke claimed that he had given Newton the "notion" of "the rule of the decrease of Gravity, being reciprocally as the squares of the distances from the Center". At the same time (according to Edmond Halley's contemporary report) Hooke agreed that "the Demonstration of the Curves generated therby" was wholly Newton's. On the other hand, Newton did accept and acknowledge, in all editions of the Principia, that Hooke (but not exclusively Hooke) had separately appreciated the inverse square law in the solar system. Newton acknowledged Wren, Hooke and Halley in this connection in the Scholium to Proposition 4 in Book 1. Newton also acknowledged to Halley that his correspondence with Hooke in 1679–80 had reawakened his dormant interest in astronomical matters, but that did not mean, according to Newton, that Hooke had told Newton anything new or original: "yet am I not beholden to him for any light into that business but only for the diversion he gave me from my other studies to think on these things & for his dogmaticalness in writing as if he had found the motion in the Ellipsis, which inclined me to try it." 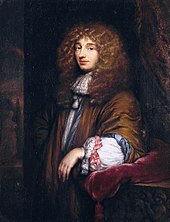 Christiaan Huygens by Caspar Netscher. Hooke recorded that he conceived of a way to determine longitude (then a critical problem for navigation), and with the help of Boyle and others he attempted to patent it. In the process, Hooke demonstrated a pocket-watch of his own devising, fitted with a coil spring attached to the arbour of the balance. Hooke's ultimate failure to secure sufficiently lucrative terms for the exploitation of this idea resulted in its being shelved, and evidently caused him to become more jealous of his inventions. Hooke developed the balance spring independently of and at least 5 years before Christiaan Huygens, who published his own work in Journal de Scavans in February 1675. 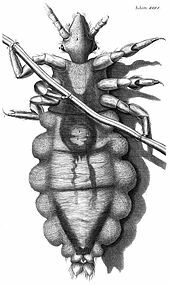 In 1665 Hooke published Micrographia, a book describing observations made with microscopes and telescopes, as well as some original work in biology. Hooke coined the term cell for describing biological organisms, the term being suggested by the resemblance of plant cells to cells of a honeycomb. The hand-crafted, leather and gold-tooled microscope he used to make the observations for Micrographia, originally constructed by Christopher White in London, is on display at the National Museum of Health and Medicine in Maryland. Micrographia also contains Hooke's, or perhaps Boyle and Hooke's, ideas on combustion. Hooke's experiments led him to conclude that combustion involves a substance that is mixed with air, a statement with which modern scientists would agree, but that was not understood widely, if at all, in the seventeenth century. Hooke went on to conclude that respiration also involves a specific component of the air. Partington even goes so far as to claim that if "Hooke had continued his experiments on combustion it is probable that he would have discovered oxygen". A lesser-known contribution, however one of the first of its kind, was Hooke's scientific model of human memory. Hooke in a 1682 lecture to the Royal Society proposed a mechanistic model of human memory, which would bear little resemblance to the mainly philosophical models before it. This model addressed the components of encoding, memory capacity, repetition, retrieval, and forgetting – some with surprising modern accuracy. This work, overlooked for nearly 200 years, shared a variety of similarities with Richard Semon's work of 1919/1923, both assuming memories were physical and located in the brain. The model's more interesting points are that it (1) allows for attention and other top-down influences on encoding; (2) it uses resonance to implement parallel, cue-dependent retrieval; (3) it explains memory for recency; (4) it offers a single-system account of repetition and priming, and (5) the power law of forgetting can be derived from the model's assumption in a straightforward way. This lecture would be published posthumously in 1705 as the memory model was unusually placed in a series of works on the nature of light. It has been speculated that this work saw little review as the printing was done in small batches in a post-Newtonian age of science and was most likely deemed out of date by the time it was published. Further interfering with its success was contemporary memory psychologists' rejection of immaterial souls, which Hooke invoked to some degree in regards to the processes of attention, encoding and retrieval. Hooke was Surveyor to the City of London and chief assistant to Christopher Wren, in which capacity he helped Wren rebuild London after the Great Fire in 1666, and also worked on the design of London's Monument to the fire, the Royal Greenwich Observatory, Montagu House in Bloomsbury, and the Bethlem Royal Hospital (which became known as 'Bedlam'). Other buildings designed by Hooke include The Royal College of Physicians (1679), Ragley Hall in Warwickshire, Ramsbury Manor in Wiltshire and the parish church of St Mary Magdalene at Willen in Milton Keynes, Buckinghamshire. Hooke's collaboration with Christopher Wren also included St Paul's Cathedral, whose dome uses a method of construction conceived by Hooke. Hooke also participated in the design of the Pepys Library, which held the manuscripts of Samuel Pepys' diaries, the most frequently cited eyewitness account of the Great Fire of London. He is but of midling stature, something crooked, pale faced, and his face but little below, but his head is lardge, his eie full and popping, and not quick; a grey eie. He haz a delicate head of haire, browne, and of an excellent moist curle. He is and ever was temperate and moderate in dyet, etc. Collection of Lectures: Physical, Mechanical, Geographical and Astronomical. London : Printed for John Martyn, printer to the Royal Society, at the Bell in S. Pauls Church-yard. 1679. includes An Attempt to prove the Annual Motion of the Earth, Animadversions on the Machina Coelestis of Mr. Hevelius, A Description of Helioscopes with other instruments, Mechanical Improvement of Lamps, Remarks about Comets 1677, Microscopium, Lectures on the Spring, etc. The posthumous works of Robert Hooke, M.D. S.R.S. Geom. Prof. Gresh. etc. containing his Cutlerian lectures, and other discourses, read at the meetings of the illustrious Royal Society... illustrated with sculptures. To these discourses is prefixt the author's life, giving an account of his studies and employments, with an enumeration of the many experiments, instruments, contrivances and inventions, by him made and produced as curator of experiments to the Royal Society published by Richard Waller, R.S. Secr. ^ Several commentators[who?] have followed Hooke in calling Newton's spiral path mistaken, or even a 'blunder', but there are also the facts: (a) that Hooke left out of account Newton's specific statement that the motion resulted from dropping "a heavy body suspended in the Air" (i.e. a resisting medium), see Newton to Hooke, 28 November 1679, document #236 at p. 301, 'Correspondence' vol. 2 cited above, and compare Hooke's report to the Royal Society on 11 December 1679 where Hooke reported the matter "supposing no resistance", see D Gjertsen, 'Newton Handbook' (1986), at p. 259; and (b) that Hooke's reply of 9 December 1679 to Newton considered the cases of motion both with and without air resistance: The resistance-free path was what Hooke called an 'elliptueid'; but a line in Hooke's diagram showing the path for his case of air resistance was, though elongated, also another inward-spiralling path ending at the Earth's centre: Hooke wrote "where the Medium ... has a power of impeding and destroying its motion the curve in which it would move would be some what like the Line AIKLMNOP &c and ... would terminate in the center C". Hooke's path including air resistance was therefore to this extent like Newton's (see 'Correspondence' vol.2, cited above, at pp. 304–306, document #237, with accompanying figure). The diagrams are also online: see Wilson, p. 241, showing Newton's 1679 diagram with spiral, and extract of his letter; also Wilson, p. 242 showing Hooke's 1679 diagram including two paths, closed curve and spiral. Newton pointed out in his later correspondence over the priority claim that the descent in a spiral "is true in a resisting medium such as our air is", see 'Correspondence', vol. 2 cited above, at p. 433, document #286. ^ Chapman, Alan (1996). "England's Leonardo: Robert Hooke (1635–1703) and the art of experiment in Restoration England". Proceedings of the Royal Institution of Great Britain. 67: 239–275. Archived from the original on 6 March 2011. ^ Drake, Ellen Tan (2006). "Hooke's Ideas of the Terraqueous Globe and a Theory of Evolution". In Michael Cooper; Michael Hunter. 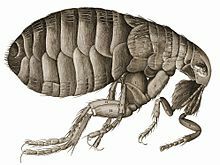 Robert Hooke: Tercentennial Studies. Burlington, Vermont: Ashgate. pp. 135–149. ISBN 978-0-7546-5365-3. ^ Drake, Ellen Tan (1996). Restless Genius: Robert Hooke and His Earthly Thoughts. Oxford University Press. ISBN 978-0-19-506695-1. ^ a b 1946-, Gribbin, John & Mary,. Out of the shadow of a giant : Hooke, Halley and the birth of British science. London. ISBN 000822059X. OCLC 966239842. ^ Robert Hooke (1705). The Posthumous Works of Robert Hooke. Richard Waller, London. p. 203. ^ * Ward, John (1740). The lives of the professors of Gresham college: to which is prefixed the life of the founder, Sir T. Gresham. Oxford. pp. 169–193. ^ a b c Jardine, Lisa (2003). The Curious Life of Robert Hooke: The Man who Measured London (1st ed.). New York: Harper Collins Publishers. p. 23. ISBN 978-0-00-714944-5. ^ Shapin, Steven; Schaffer, Simon (1985). "2". Leviathan and the Air-Pump: Hobbes, Boyle and the Experimental Life. Princeton: Princeton University Press. ISBN 978-0-691-08393-3. Retrieved 11 September 2009. ^ Fulton, John F. (1960). "The Honourable Robert Boyle, F.R.S. (1627–1692)". Notes and Records of the Royal Society of London. 15: 119–135 (123). doi:10.1098/rsnr.1960.0012. ^ Gunther, Robert (1923–67). Early Science in Oxford. 7. privately printed. ^ De Milt, Clara (November 1939). "Robert Hooke, Chemist". Journal of Chemical Education. 16 (11): 503–510. Bibcode:1939JChEd..16..503D. doi:10.1021/ed016p503. ^ “The Heat Engine Idea in the Seventeenth Century” Rhys Jenkins, Paper read to the Chartered Institute of Patent Agents, 21 October 1936. ^ Rosen, William (2012). The Most Powerful Idea in the World: A Story of Steam, Industry and Invention. University of Chicago Press. pp. 74, 331. ISBN 978-0226726342. ^ More, Louis Trenchard (1934). Isaac Newton. New York: Charles Schribner's Sons. pp. 94–95. ^ a b Hooke, Robert (1935). Robinson, H. W.; Adams, W., eds. The Diary of Robert Hooke, M.A., M.D., F.R.S., 1672–1680. London: Taylor & Francis. ^ Inwood 2002, pp. 1,2. ^ Robert Hooke, De Potentia Restitutiva, or of Spring. Explaining the Power of Springing Bodies, London, 1678. ^ "Hooke Folio Online". Webapps.qmul.ac.uk. Archived from the original on 18 July 2012. Retrieved 10 September 2012. ^ Thomas Birch, The History of the Royal Society of London, … (London, England: 1756), vol. 2, pages 68–73; see especially pages 70–72. ^ Iliffe, Rob (2007). Newton:A Very Short Introduction. Oxford University Press. pp. 140–. ISBN 978-0-19-157902-8. ^ See p. 309 in 'Correspondence of Isaac Newton', Vol. 2 cited above, at document #239. ^ Whiteside, D T (1991). "The pre-history of the 'Principia' from 1664 to 1686". Notes and Records of the Royal Society of London. 45: 11–61 (13–20). doi:10.1098/rsnr.1991.0002. JSTOR 531520. ^ The second extract is quoted and translated in W.W. Rouse Ball, "An Essay on Newton's 'Principia'" (London and New York: Macmillan, 1893), at p. 69. ^ The original statements by Clairaut (in French) are found (with orthography here as in the original) in "Explication abregée du systême du monde, et explication des principaux phénomenes astronomiques tirée des Principes de M. Newton" (1759), at Introduction (section IX), p. 6: "Il ne faut pas croire que cette idée ... de Hook diminue la gloire de M. Newton", [and] "L'exemple de Hook" [serves] "à faire voir quelle distance il y a entre une vérité entrevue & une vérité démontrée". ^ Hooke, Robert (1665). Micrographia: Or Some Physiological Descriptions of Minute Bodies Made by Magnifying Glasses, with Observations and Inquiries Thereupon. Courier Dover Publications. p. 113. ISBN 978-0486495644. Retrieved 22 July 2014. ^ Partington, J. P. (1951). A Short History of Chemistry (2nd ed.). London: Macmillan and Company. pp. 78–80. ^ Rudwick, Martin J.S. (1976). The Meaning of Fossils. The University of Chicago Press. p. 54. ^ Bowler, Peter J. (1992). The Earth Encompassed. W. W. Norton. pp. 118–119. ^ Hirshfeld, Alan W. (2001). Parallax, The Race to Measure the Cosmos. New York: W. H. Freeman. pp. 144–149. ISBN 978-0716737117. ^ Ashbrook, Joseph (1984). The Astronomical Scrapbook. Cambridge, Massachusetts: Sky Publishing Corporation. pp. 240–241. ISBN 978-0521106047. ^ Singer, B. R. (1979). "Robert Hooke on memory: Association and time perception (I)". Notes and Records of the Royal Society of London. 31 (1): 115–131. doi:10.1098/rsnr.1976.0003. JSTOR 531553. PMID 11609928. ^ a b Hintzman, D. L. (2003). "Robert Hooke's model of memory". Psychonomic Bulletin & Review. 10 (1): 3–14. doi:10.3758/BF03196465. PMID 12747488. ^ Schacter, D. L.; Eich, J. E. & Tulving, E. (1978). "Richard Semon's theory of memory". Journal of Verbal Learning & Verbal Behavior. 17 (6): 721–743. doi:10.1016/S0022-5371(78)90443-7. ^ Cooper, Michael (2003). A More Beautiful City: Robert Hooke and the Rebuilding of London after the Great Fire. Sutton Publishing Ltd. ISBN 978-0-7509-2959-2. ^ Montagu, M. F. Ashley (1941). "A Spurious Portrait of Robert Hooke (1635–1703)". Isis. 33: 15–17. doi:10.1086/358521. See also 3 July 1939 issue of Time (p. 39). ^ Rod Beavon (26 March 1999). "Robert Hooke". Rod.beavon.clara.net. Archived from the original on 17 July 2012. Retrieved 10 September 2012. ^ Burgan, Michael (2008). Robert Hooke Natural Philosopher and Scientific Explorer. Minneapolis, Minnesota: Compass Point Books. pp. Cover, 21, 26, 45, 65, 77, 88, 96, 98–99, 101. ISBN 978-0756533151. ^ Fekany Lee, Kimberly (2009). Cell Scientists: from Leeuwenhoek to Fuchs. Compass Point Books, Minneapolis, Minnesota. ISBN 978-0-7565-3964-1. ^ Chapman, Allan (2005). England's Leonardo Robert Hooke and the Seventeenth-Century Scientific Revolution. Institute of Physics Publishing Ltd. pp. Portrait of Robert Hooke inside dust jacket and last page of plates. ISBN 978-0-7503-0987-5. ^ Chapman, Allan. "Robert Hooke: the forgotten genius of physics". Interactions (April 2005). ^ "(3514) Hooke". (3514) Hooke In: Dictionary of Minor Planet Names. Springer. 2003. p. 295. doi:10.1007/978-3-540-29925-7_3513. ISBN 978-3-540-29925-7. Andrade, E. N. De C. (1950). "Wilkins Lecture: Robert Hooke". Proceedings of the Royal Society of London. Series B, Biological Sciences. 137 (887): 153–187. Bibcode:1950RSPSB.137..153A. doi:10.1098/rspb.1950.0029. JSTOR 82545. Bennett, Jim; Michael Cooper; Michael Hunter; Lisa Jardine (2003). London's Leonardo: The Life and Work of Robert Hooke. Oxford University Press. ISBN 978-0-19-852579-0. Chapman, Allan (2004). England's Leonardo: Robert Hooke and the Seventeenth-century Scientific Revolution. Institute of Physics Publishing. ISBN 978-0-7503-0987-5. Chapman, Allan; Kent, Paul, eds. (2005). Robert Hooke and the English Renaissance. Gravewing. ISBN 978-0-85244-587-7.
Cooper, Michael (2003). 'A More Beautiful City': Robert Hooke and the Rebuilding of London after the Great Fire. Sutton Publishing Ltd. ISBN 978-0-7509-2959-2. Gunther, Robert, ed. (1923–67). Early Science in Oxford. 7. privately printed. Hall, A. R. (1951). "Robert Hooke and Horology". Notes and Records of the Royal Society of London. 8 (2): 167–177. doi:10.1098/rsnr.1951.0016. Stevenson, Christine (February 2005). "Robert Hooke, Monuments and Memory". Art History. 28 (1): 43–73. doi:10.1111/j.0141-6790.2005.00453.x. Wikimedia Commons has media related to Robert Hooke. Wikisource has the text of the 1911 Encyclopædia Britannica article Hooke, Robert. This page was last edited on 9 April 2019, at 14:14 (UTC).